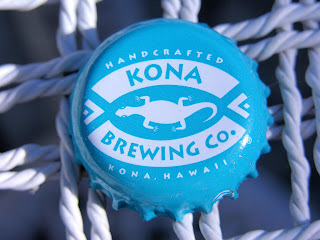 Kona Brewing Co.’s Wailua Wheat, a summertime limited release that’s brewed with passion fruit is…surprisingly good. That about sums it up. Typically I’m wary of any beer brewed with fruit. Most turn out sweet, or just terribly wrong. The wife and I first tried the Wailua Wheat on tap at a restaurant in Monterey after our server recommended it. She brought us a taste and we were sold. It’s a flavorful wheat beer with no icky fruit “flavors,” no added sweetness. Just a good wheat beer for a summer barbeque. We found it later in bottles at Whole Foods and while were discussing whether or not to pick up a cold pack, a woman shopping nearby stopped to tell us how good it was. It’s clearly a beer people like to recommend. Now it’s my turn to do the recommending. So far this is the only beer I’ve tried from the Kona brewing company, but I’ve got plans for that to change.